A Great radio application for those of you who love streaming radio .The simplicity of this app will appeal to those who are satisfied with great content and reliability. Radio World offers streaming audio from optimized radio stations across the World. The Player currently offers more than 1000 station streams. Now get in touch with your radio station any where any time, with your Android smart phone and feel the passion of listening rock or bass radio station in one touch. FEATURE • Supports MP3 streaming radios with best sound quality • Includes more than 20 Genre like Pop, Rock, Sports, Students, Talk, Spanish, German, UK, America and many more. 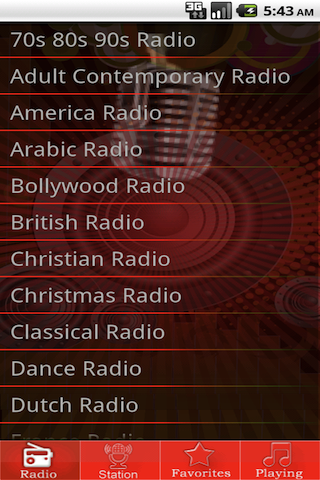 • Includes more than 150 stations from all over the world. • Includes public Radio stations, Regional stations. 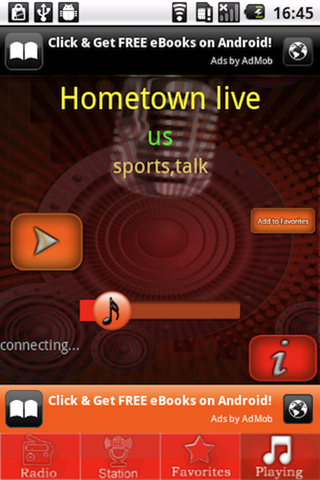 • Includes a large selection of National, Local, and International Sports channels, the best sports selection of any app.